The deal only affects a small percentage of people in Massachusetts for now, as fewer than 200,000 people carry that insurance in the Bay State. 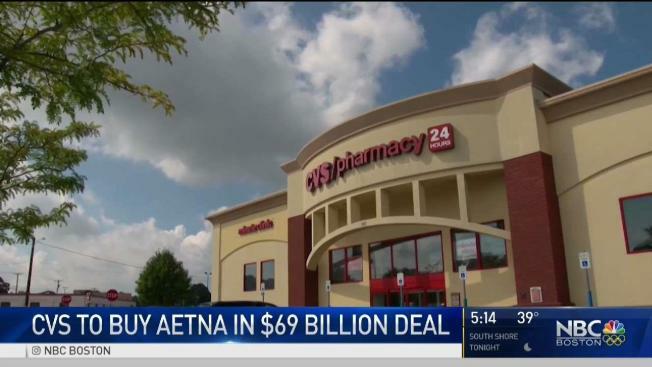 It's been a shakeup for the health care industry after CVS and Aetna announced their $69 billion deal, a move that has caused insurance experts to urge everyone to pay attention. CVS, the second largest U.S. drug store chain, plans to buy Aetna, the third largest health insurer, in order to push deeper into customer care. In time, shoppers may find more clinics in CVS stores and more services they can receive through the network of nearly 10,000 locations. CVS already has more than 1,000 Minute Clinics helping people deal with issues like high blood pressure and diabetes in between doctor appointments. "I am very concerned about this," said Sen. Elizabeth Warren. Health Care For All, a Boston non-profit, says both CVS and Aetna have billions of dollars, and they want to make sure the companies have patients' best interest at heart and not their own financial gain. "What it means is that they are going to try to direct their patients to use their pharmacy, and it could mean restriction for certain drugs," said Brian Rossman of Health Care For All. It could be a game changer for the healthcare landscape, according to Wendy Mariner, a professor of health law at Boston University. She says it highlights the ever-changing way Americans are getting their care. "It shows that now we are depending on the private market more and more to structure, and the health care system is really up for grabs," said Mariner. "People could monitor medications and make sure people aren't taking too many or taking the wrong ones." She adds that the decision may be a response to competition from Amazon and Walmart. It's a game of wait-and-see for now, with possible consequences to customer's bottom line. "In general, if you end up with a very large consolidated organization with less competition, consumers will end up paying more for less," said Mariner. The Department of Justice and the Antitrust Division still have to approve the deal.